Editions & Additions offers a fascinating journey into the highly skilled, labor-intensive world of printmaking and the more intuitive world of journal making. 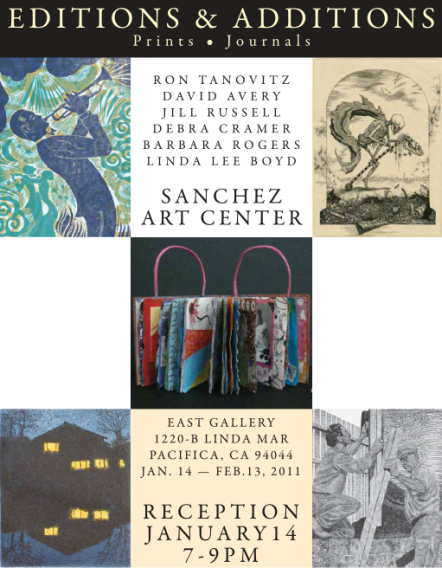 The printmaking artists in Editions & Additions are David Avery, Linda Lee Boyd, Barbara Rogers, and Ron Tanovitz. The two journal makers, Debra Cramer and Jill Russell, besides showing their individual journals, have collaborated by exchanging journals and adding onto each other’s pages on a weekly basis over a period of time. The results are well worth the patience required, showing intuitive leaps into color and design that nurture the imagination. 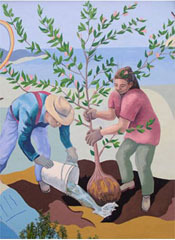 If the nature of journals is to express innermost being in a free-flowing and intuitive process, printmaking has been called a true “labor of love,” involving techniques that are as diverse as etching on metal plates with chemicals and hand-carving wood to produce woodcuts and wood engravings. David Avery prefers the subtleties and nuance of black and white in his etchings, while Ron Tanovitz plays with the delights of color overlaid with color. Linda Lee Boyd’s woodcut series focuses on workers, seeking to capture how people feel about their work in the many steps and iterations required to complete a woodcut print. Barbara Rogers’ atmospheric series of “neighborhood” prints is intrinsically appealing and nostalgic, in a good way.